This downloadable PDF worksheet will help students orgranize their 5 paragraph essays. 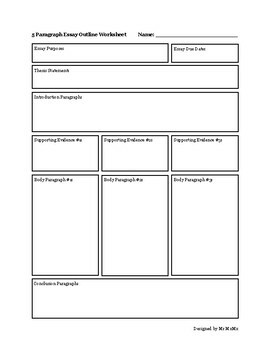 The first page of the PDF is a blank worksheet you can print out for your students. The second page contains explanations of how students can effectively fill out the worksheet. I suggest filling one worksheet out yourself with a mock essay as a model for your students.